I have been working with a Grade 4 student very closely over the past 2 months. 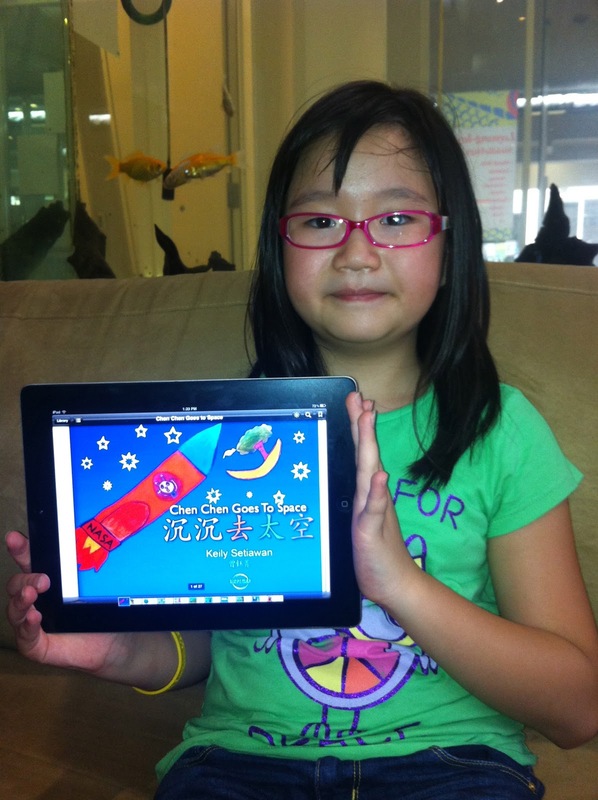 We have been creating a book in Chinese during Chinese language classes. 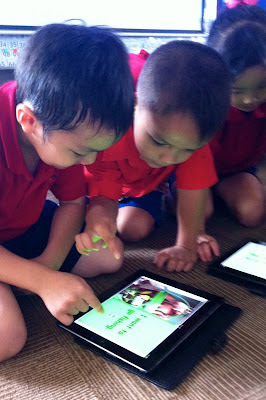 I am a Tech Coach at my school and I was keen to get the iPads being used across the school. I found out about the app Book Creator which allows even very young children to create a talking book directly on the iPad. I started using this app in language classes. 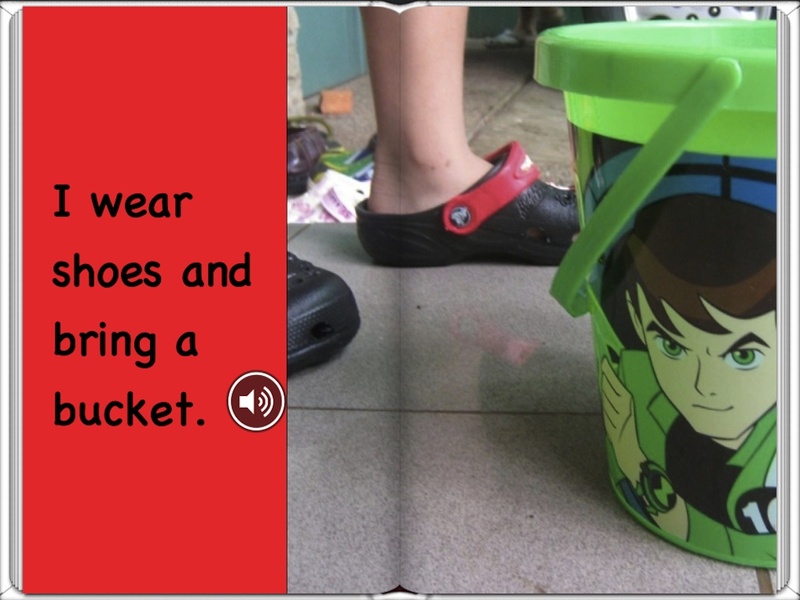 It works really well as the student can record their voice reading their own story really easily, directly on the iPad. Since then the app creator Dan Amos has added me to his website here. I wrote a blog post about it here. First you need time to work on the story, the plan, the artwork and the voice recordings. After the story is finished you need to share it with others for proof-reading and feedback. So far this is pretty much inline with any kind of story creation. Next you will need to ask the student's parent to create an iTunes account and an iTunes Producer account. Students under 13 need to have a parent publish their work for them. For the case of Keily, I invited her parents to school so that I could guide them through the process of creating the necessary accounts. To publish with the Apple iBookstore on iTunes, you need to have an iTunes account with a credit card. You will be asked to provide that credit card information even thought this process doesn't cost anything. Next you will need to create the book package for uploading to iTunes Connect. I created that for my student as you really need to pay attention to the size of the book cover image and sample pages. I used the app Book Creator which produces the book file that is standards compliant with the iBookstore. I sat down with Keily's parents to help them complete all the information needed in the publishing package. After we had successfully uploaded the book I taught the parents how to email iTunes Connect to ask about the book and when it would be published. After a few days we got a message from the iBookstore that the Chinese language is not supported. We were so surprised and worried that all our hard work had been for nothing. We decided to revise the book so that it was in English with Chinese as a bilingual book. The Chinese characters have been put in the book as JPEG so that there would be no problems with the script. Thankfully this made the book acceptable and we were relieved that it has now been published. 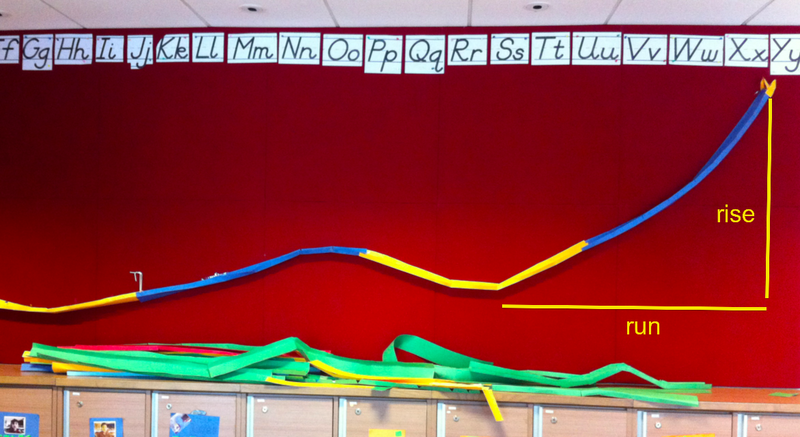 As I predicted - the students LOVE this project. We began with making roller coasters in Minecraft but there are quite a few things about Minecraft that just don't work in the real world. Now we are on to making Marble Coasters on the walls of the classroom. Slow and clanking, the string of cars is pulled up to the crest of the tallest point on the roller coaster. One by one, the cars start downhill on the other side, until gravity takes over and the full weight of the train is careening down into curves, twists, and turns. The roller coaster is a great example of conversions between potential energy (stored energy) and kinetic energy (the energy of motion). As the cars are being pulled up to the top of the first hill, they are acquiring potential energy. The chain that pulls them up the hill works against the force of gravity. At the top of the hill, the cars' potential energy is at it's maximum. When the cars start down the other side, this potential energy is converted to kinetic energy. The cars pick up speed as they go downhill. As the cars go through the next uphill section, they slow down. Some of the kinetic energy is now being converted to potential energy, which will be be released when the cars go down the other side. You've probably noticed that the first hill on the roller coaster is always the highest (unless the coaster is given another "boost" of energy along the way). This is because not all of the potential energy is converted to kinetic energy. Some of the potential energy is "lost" in other energy conversion processes. You can investigate the conversion of potential energy to kinetic energy with this project. 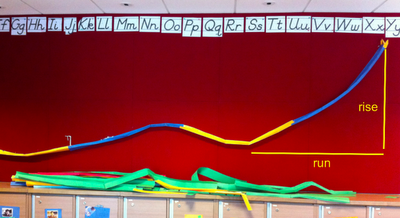 There are as many possible variations to this project as there are twists and turns on a great roller coaster ride, but a good place to start is to see how much initial height you need in order to have your marble successfully navigate a loop in the track. You'll use the same size loop for each of your tests, but you'll add (or subtract) track before the loop so that you can change the initial height where the marble starts. For each track configuration, you should try at least 10 separate tests with the marble to see whether it can loop the loop or not. You should also measure the slope of each track configuration. An easy way to think about the slope is the expression rise/run (see the illustration below). The rise is the height of the starting point, and the run is the horizontal distance from the starting point to the beginning of the loop. The illustration above shows how to measure "rise" and "run" in order to calculate the average slope of the track leading in to the loop. How much height (rise) will be required to successfully navigate a given loop size? A foam roller coaster for marbles is easy to build, so try it for yourself and find out! So you will need to measure the height (rise) and the run (length along the bottom) of your first hill run on your coaster. I wonder how these numbers will compare? My challenge to you is to make a successful loop de loop. My son has published his first story on the iBookstore. This story was his idea based on playing at the local river in our housing complex in Indonesia. John likes to play at the river (with adult supervision) and in this story he tells about catching fish using a plastic cup. My son told me this story and I suggested that we make it into a book. We used the app Book Creator to make the story directly on the iPad. I like that we can stretch the photos so that they either fill one page or go over the page fold slightly to make the layout more interesting. John is only 5 and is only just beginning to type up words. For this story he came up with the sentences but I typed in the words for him. I took the photos as well. We began one morning. I walked and he rode his bike to the river. I asked him to stop along the way for photos. After he had finished I downloaded the photos from my iPhone to my iPad. I worked with John to choose which ones to use to tell the story. The finished book is 50 pages long. John then recorded each page by reading directly on the app. After we had finished and were happy with the results we took the book to school and presented it to his Kindergarten class for feedback. I was easily able to share the book to 6 iPads. Here is John proudly sharing his book with his class. We had such a great reaction to this book so I decided to publish it on the iBookstore. I am already a member of iTunes Connect having already published an iBook. I am well aware of how to get a book published. I uploaded the book and was very happy that there were no errors. I am impressed with this app Book Creator as it is easy to use and produces a format that is inline with the requirements from the iBookstore. After 2 weeks I sent a message inquiring about this book. It took a couple of days to get an answer which was a standard one telling me that my book needed to pass the content check. After another week had passed I sent another message and then a few days later I sent another message again. I think that there must be a lot of books under consideration in the iBookstore. When I published my first iBook that I made with iBooks Author, the whole process only took 2 weeks. A month passed with this one with very little response. Finally whilst I was on term break, I got an email telling me that this book 'Little Fish' had been published. My advice to anyone wishing to publish with the iBookstore is to be patient. I'm sure that they get a lot of books to consider. I am currently working with a parent to help them publish a fantastic book created by one of my students. This book is for free, you can get your copy here Little Fish.